Gravadlax (fresh salmon cured in the fridge with dill, salt and sugar) is usually served in delicate petals, but I’ve struggled to create perfect thin slices at home, no matter how energetically I brandish my rapier of a filleting knife. So now I serve it chopped in the style of a salmon tartare. This is extremely easy to make and - if you follow my instructions carefully - is foolproof. The only part about the recipe you might find tricky is cutting very even, thin strips of cucumber. You will need a mandolin for this, or a lot of patience. 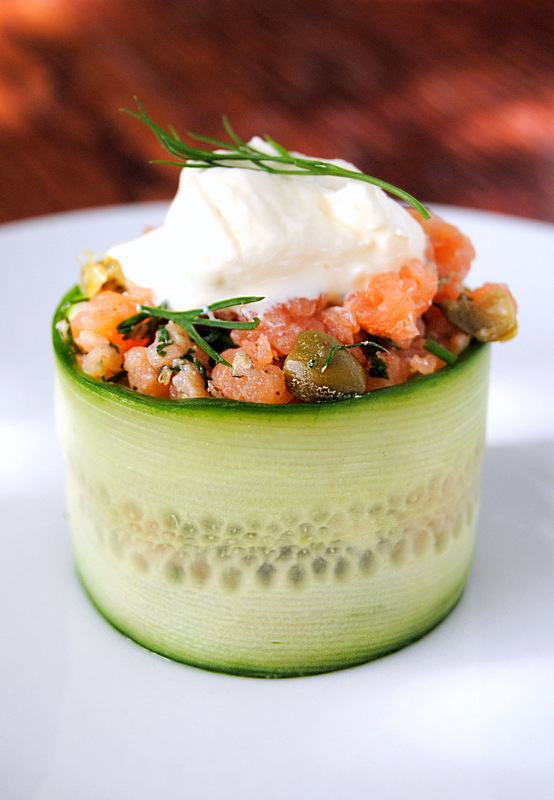 If you have neither, serve the tartare in elegant little heaps piled on a circle of fine cucumber rings. This dish is ideal for casual entertaining because you can start the gravadlax up to 48 hours ahead, then chop it all up and fill the cucumber rings an hour or two before your guests arrive. It's also a great low-carb #LCHF choice, and suitable for diabetics. I was given this recipe many years ago by Lorraine Deans, who was co-owner of the Hertford Country Restaurant and Inn, close to where I grew up in Elandsdrift, north of Johannesburg. I went to interview Lorraine for a book I was writing, and she bought out a platter of the most delicious salmon I'd ever tasted. Not that I'd tasted much salmon at that point (you didn't often see fresh salmon in the shops when I was in my twenties), but it make a big impression. I begged her for the recipe, and I've been making it ever since, with a few tweaks of my own. 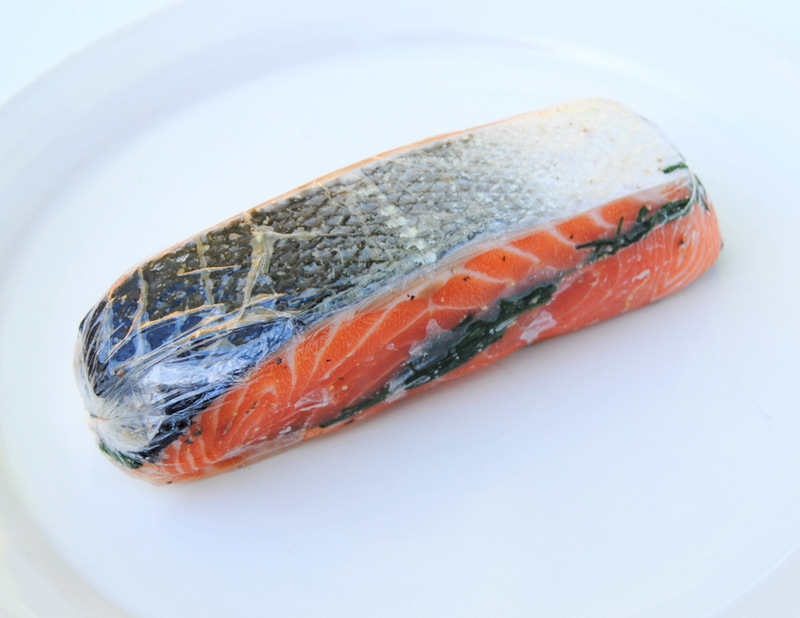 This is best with top-grade imported fresh salmon, but you can also use excellent ThreeStreams lightly smoked trout. Postscript: Here's a December 2014 wine pairing by Michael Olivier. Ask your fishmonger to pin-bone the salmon fillets and cut away the blood line. Place a fillet, skin side down, on a large sheet of clingfilm. Using a mortar and pestle, grind the salt, peppercorns and sugar to a coarse powder and sprinkle it all over the salmon fillet. Cover the fillet with 10-12 big sprigs of dill and sprinkle with lemon zest and 2 tablespoons of gin. Place the other salmon fillet flesh-side down on top. Wrap tightly in clingfilm, place in a big shallow dish and put a weight (a brick is ideal, or use tins from the cupboard) on top. Refrigerate for 12 hours, then turn the parcel over, weigh it down again, and cure for a further 12 hours. Unwrap the parcel, remove the dill and wipe off the curing spices. Sprinkle the remaining 2 tablespoons of gin over the lower fillet, cover with a new layer of dill sprigs, replace the top fillet, wrap in new clingfilm and refrigerate for up to 36 hours, or until needed. To serve, remove the dill sprigs and pat dry with kitchen paper. Cut the salmon flesh away from the skin, place on a board and chop into small pieces using a sharp knife or mezzaluna. Place in a bowl and stir in the capers, chives and dill. Season with plenty of black pepper (you shouldn’t need to add more salt). Don't add any lemon juice, as this will 'cook' the fish. Use a mandolin or a very sharp knife, cut the cucumbers, lengthways, into strips each about millimetre thick. Curl each strip into a neat ring and press the ends to secure. (If the cucumber strips refuse to stay in a ring, fix the ends in place with big paper clips. Or remove the bottoms of tuna tins using a tin opener and use those as rings to form the cucumber circles.) Place the cucumber rings on individual plates or a single large platter. 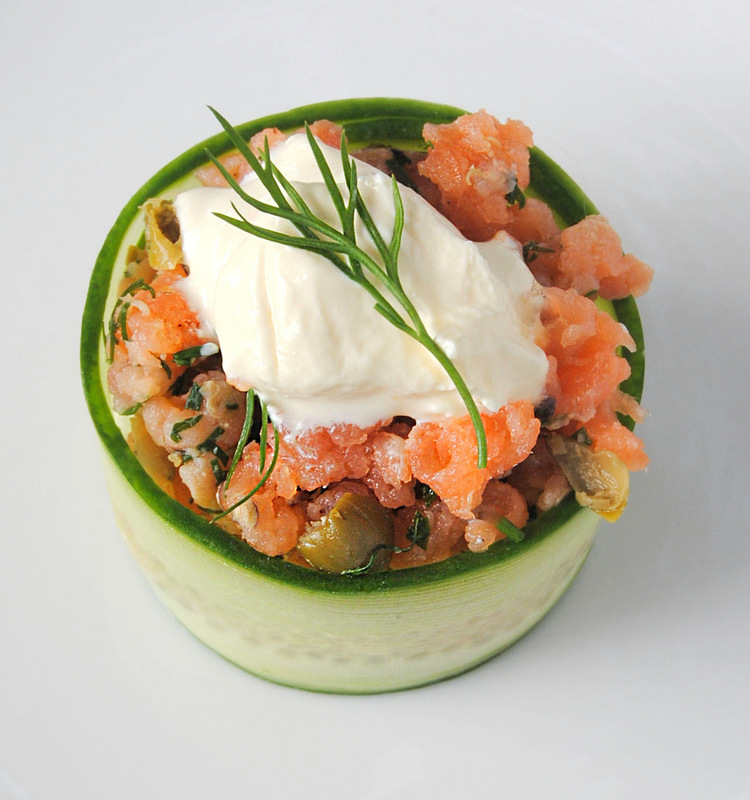 Pile the tartare into the cucumber rings and top each one with a flurry of crème fraîche. Serve with lemon wedges and melba toast. Serves 8 as a starter or snack. Thanks, Jane-Anne, you've finally cleared up for me the issue of what true gravadlax is... ever since I came to SA, I've heard any thin slices of salmon referred to as gravadlax, even when I was sure it was smoked salmon... now I know the distinction. I don't often come across salmon out our way, but this sounds like a delicious way of dealing with it! You're welcome Kit. Thanks for the comment. Good grief, I missed this one! Looks so beautiful and the gin is a very interesting twist! Is it 2x 750g salmon fillets or 750g total? Thanks for your comment. Apologies for the unclear instructions. I have amended the text. Please use 2 fillets weighing a total of 750g.